Marc R. Benioff is the chairman and CEO of salesforce.com (NYSE: CRM), which he cofounded in 1999. Under Benioff's direction, salesforce.com has grown from a groundbreaking idea into a publicly traded company that is the market and technology leader in enterprise cloud computing. Salesforce.com has received a Wall Street Journal Technology Innovation Award, been lauded as one of BusinessWeek's Top 100 Most Innovative Companies, been named No. 7 on the Wired 40, was selected for the past two years as a Top Ten Disrupter by Forbes, and been voted one of the world's most ethical companies by Business Ethics Magazine. Benioff is the recipient of many awards for pioneering innovation, including the 2007 Ernst & Young Entrepreneur of the Year. 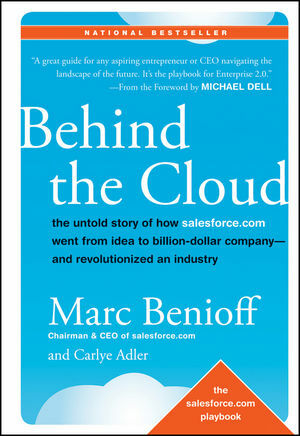 In 2000, Benioff launched the Salesforce.com Foundationnow a multimillion-dollar global organization. He lives in San Francisco. Carlye Adler is an award-winning journalist whose articles have appeared in BusinessWeek, Departures, Fast Company, Fortune, Forbes, Portfolio, Wired, and Time. She cowrote, with Marc Benioff, The Business of Changing the World. She lives in New York City. Foreword (Michael Dell, Chairman and CEO of Dell). Part 1 The Start-Up Playbook: How to Turn a Simple Idea into a High Growth Company. Play #1: Allow Yourself Time to Recharge. Play #2: Have a Big Dream. Play #3: Believe in Yourself. Play #4: Trust a Select Few with Your Idea and Listen to Their Advice. Play #5: Pursue Top Talent as If Your Success Depended on It. Play #6: Sell Your Idea to Skeptics and Respond Calmly to Critics. Play #7: Define Your Values and Culture Up Front. Play #8: Work Only on What Is Important. Play #9: Listen to Your Prospective Customers. Play #11: Have—and Listen to—a Trusted Mentor. Play #12: Hire the Best Players You Know. Play #13: Be Willing to Take a Risk—No Hedging. Part 2 The Marketing Playbook: How to Cut Through the Noise and Pitch the Bigger Picture. Play #16: Party with a Purpose. Play #17: Create a Persona. Play #18: Differentiate, Differentiate, Differentiate. Play #19: Make Every Employee a Key Player on the Marketing Team, and Ensure Everyone Is On-Message. Play #20: Always, Always Go After Goliath. Play #21: Tactics Dictate Strategy. Play #22: Engage the Market Leader. Play #23: Reporters Are Writers; Tell Them a Story. Play #24: Cultivate Relationships with Select Journalists. Play #25 Make Your Own Metaphors. Play #26: No Sacred Cows. Part 3 The Events Playbook: How to Use Events to Build Buzz and Drive Business. Play #27: Feed the Word-of-Mouth Phenomenon. Play #28: Build Street Teams and Leverage Testimony. Play #29: Sell to the End User. Play #30: The Event Is the Message. Play #31: Reduce Costs and Increase Impact. Play #32: Always Stay in the Forefront. Play #33: The Truth About Competition (It Is Good for Everyone). Play #34: Be Prepared for Every Scenario . . . and Have Fun. Play #35: Seize Unlikely Opportunities to Stay Relevant. Play #36: Stay Scrappy . . . but Not Too Scrappy. Part 4 The Sales Playbook: How to Energize Your Customers into a Million-Member Sales Team. Play #37: Give It Away. Play #38: Win First Customers by Treating Them Like Partners. Play #39: Let Your Web Site Be a Sales Rep. Play #40: Make Every Customer a Member of Your Sales Team. Play #41: Telesales Works (Even Though Everyone Thinks It Doesn't). Play #42: Don't Dis Your First Product with a Discount. Play #43: Sales Is a Numbers Game. Play #44: Segment the Markets. Play #45: Leverage Times of Change. Play #46: Your Seeds Are Sown, so Grow, Grow, Grow. Play #47: Land and Expand. Play #48: Abandon Strategies That No Longer Serve You. Play #49: Old Customers Need Love. Play #50: Add It On and Add It Up. Play #51: Success Is the Number-One Selling Feature. Part 5 The Technology Playbook: How to Develop Products Users Love. Play #52: Have the Courage to Pursue Your Innovation—Before It Is Obvious to the Market. Play #53: Invest in the Long Term with a Prototype That Sets a Strong Foundation. Play #54: Follow the Lead of Companies That Are Loved by Their Customers. Play #55: Don't Do It All Yourself; Reuse, Don't Rebuild. Play #56: Embrace Transparency in Everything You Do or Be Transparent and Build Trust. Play #57: Let Your Customers Drive Innovation. Play #58: Make It Easy for Customers to Adopt. Play #59: Transcend Technical Paradigms. Play #60: Provide a Marketplace for Solutions. Play #61: Harness Customers' Ideas. Play #62: Develop Communities of Collaboration (aka Love Everybody). Part 6 The Corporate Philanthropy Playbook: How to Make Your Company About More Than Just the Bottom Line. Play #64: The Business of Business Is More Than Business. Play #65: Integrate Philanthropy from the Beginning. Play #67: Choose a Cause That Makes Sense and Get Experts on Board. Play #68: Share the Model. Play #69: Build a Great Program by Listening to the Constituents. Play #70: Create a Self-Sustaining Model. Play #71: Share Your Most Valuable Resources—Your Product and Your People. Play #72: Involve Your Partners, Your Vendors, Your Network. Play #73: Let Employees Inspire the Foundation. Play #74: Have Your Foundation Mimic Your Business. Part 7 The Global Playbook: How to Launch Your Product and Introduce Your Model to New Markets. Play #75: Build Global Capabilities into Your Product. Play #76: Inject Local Leaders with Your Corporate DNA. Play #77: Choose Your Headquarters and Territories Wisely. Play #78: Box Above Your Weight. Play #79: Scale Without Overspending. Play #80: Understand Sequential Growth. Play #81: Uphold a One-Company Attitude Across Borders. Play #82: Follow Strategy, Not Opportunity. Play #83: Going Far? Take a Partner. Going Fast? Go Alone. Play #84: Fine-Tune Your International Strategy. Play #86: Handle Global Disputes with Diplomacy (aka Light and Love). Play #87: Edit an Overarching Outlook. Play #88: Bring Old Tricks to New Regions. Play #89: Don’t Use a “Seagull Approach”; the Secret to Global Success Is Commitment. Part 8 The Finance Playbook: How to Raise Capital, Create a Return, and Never Sell Your Soul. Play #90: Don't Underestimate Your Financial Needs. Play #91: Consider Fundraising Strategies Other Than Venture Capital. Play #92: Use Internet Models to Reduce Start-Up Costs. Play #93: Set Yourself Up Properly from the Beginning, Then Allow Your Financial Model to Evolve. Play #94: Measure a Fast-Growing Company on Revenue, Not Profitability. Play #95: Build a First-Class Financial Team. Play #96: Be Innovative and Edgy in Everything You Do—Except When It Comes to Your Finances. Play #97: When It Comes to Compliance, Always Play by the Rules. Play #98: Focus on the Future. Play #99: Allow for Change as Your Company Grows. Part 9 The Leadership Playbook: How to Create Alignment—the Key to Organizational Success. Play #100: Use V2MOM to Focus Your Goals and Align Your Organization. Play #101: Use a Top-Down and Bottom-Up Approach. Play #102: Build a Recruiting Culture. Play #103: Recruiting Is Sales. Play #104: Keep Your Standards High as You Grow. Play #105: How to Retain Top Talent. Play #106: The Importance of Mahalo. Play #107: Build Loyalty by Doing the Right Thing. Play #108: Challenge Your Best People with New Opportunities. Play #109: Solicit Employee Feedback—and Act on It. Play #111: Make Everyone Successful.